Business Analytics will help demystify data and equip you with concrete skills you can apply in your everyday decision-making. Beginning with basic descriptive statistics and progressing to regression analysis, you’ll learn business analytics through real-world examples, from performing A/B testing on a website to using sampling to check warehouse inventory. Janice Hammond is the Jesse Philips Professor of Manufacturing and Senior Associate Dean for Culture and Community at Harvard Business School. She currently teaches Supply Chain Management in the MBA program and is program chair for the HBS Executive Education International Women’s Foundation and Women’s Leadership Programs. Her research focuses on speed and flexibility in manufacturing and logistics systems to respond to changing customer demand. Prepare for your next opportunity by learning how to apply basic statistics to real business problems. Strengthen your analytical skills before pursuing an MBA or other graduate program. Develop a data mindset to make more informed business decisions and advance your career. Business Analytics consists of approximately 40 hours of material delivered over an eight-week period. You can complete the coursework on your own time while meeting regular deadlines. Note: By enrolling in the Business Analytics certificate program, participants will be ineligible to enroll in the CORe program. By enrolling in the CORe program, participants will be ineligible to enroll in Business Analytics as an individual certificate program. 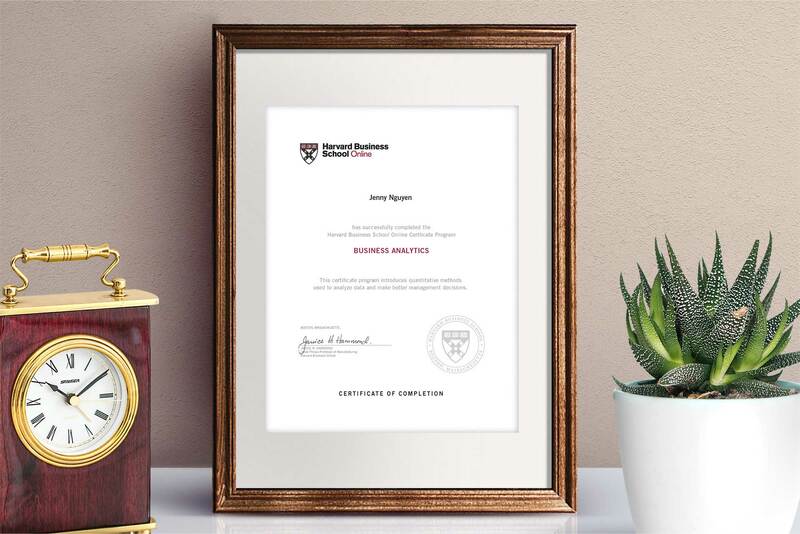 Harvard Business School Online offers a unique and highly engaging way to learn vital business concepts. Immerse yourself in real challenges faced by business leaders across a variety of industries—from how to accurately predict home video sales based on box office performance to forecasting staffing needs for a hotel front desk. You’ll wrestle with the same issues and imperfect information, while problem-solving and interacting with fellow learners from around the world. I am applying concepts from the Business Analytics course in my current venture. From designing surveys to hypothesis testing, every aspect of data collection and analysis informs our customer validation process. The way Business Analytics blended numbers with the impact on business forecasting and improvement of business processes was simply amazing. The real-life cases from different spheres made the learning more insightful. The subject further helped affirm the power of data/numbers in analyzing and forecasting about a particular business initiative. Business Development at Indian Oil Corporation, Ltd.
Enroll today in Harvard Business School Online's Business Analytics course.